We turn to the New World suboscines and find that the avian tree is again divided into two parts: Tyrannida and Furnariida. As Tyrannida is the smaller group, it goes first. The Tyrannida are the other group of New World suboscines. They have been variously separated into three to five families, sometimes including the Phytotomidae (plantcutters) and Oxyruncidae (sharpbill). The taxonomic position of a number of the Tyrannida has been often been called into question (e.g., McKitrick, 1985), and even discerning the major groups has sometimes been a problem. Recent treatments have generally involved four main groups: Pipridae (manakins), Cotingidae (cotingas), Tityridae (tityras and becards), Tyrannidae (tyrant flycatchers). The last is sometimes divided. However, other than argeement that they are each other's closest relatives, there is no consensus on how they relate. There are 18 possible fully resolved trees. Some analyses do not fully resolve the tree, but of those that do, at least five different versions have appeared in the recent literature. Three major contenders are shown below. The Ericson et al. tree is based on many genes, but relatively few species. The other two are based on DNA from many species, but fewer genes. As for the genes themselves: Ericson et al. include RAG-1, G3PDH, c-myc, cyt-b, myoglobin, and ODC. Ohlson et al. (2008) consider G3PDH, myoglobin, and ODC (ODC alone with Ericson's species gives the same result), while Tello et al. (2009) look at RAG-1 and RAG-2. Ohlson et al. (2013a), which combinines data from Ohlson et al. (2008) and Tello et al. (2009). The TiF list now uses the new Ohlson et al. (2013a) arrangement. There are also a number of taxa that have been quite troublesome. Already in 1989, Prum and Lanyon used morphological evidence to argue that Schiffornis, previously considered manikins, were actually part of a clade related to the becards and tityras. This has subsequently been supported by genetic evidence. Some of the other birds in the clade had previously been considered Tyrannidae. They also called attention to some additional problematic genera, including Neopipo, Piprites, Neopelma, Tyranneutes and Sapayoa that seemed misplaced. It was eventually realized that Sapayoa is an Old World Suboscine. Neopelma and Tyranneutes are now known to be manakins. But what about Neopipo and Piprites? And what about other troublesome taxa such as the sharpbill. Ohlson et al. (2013a) note that several of the recognized troublesome species and groups (and some others too) are quite distantly related to the main clades. They estimate the most recent common ancestors from these groups to the nearest major clades occurred 25-30 million years ago, during the Oligocene. As each group has no close relative and as they are distinct enough to cause confusion about where they fit in, Ohlson et al. (2013a) recommend elevating these groups to family status. One of these distinct groups is the familiar Sharpbill, which has often been treated as a monotypic family (Oxyruncidae). The plantcutters do not qualify, being embedded in the cotingas. A second group, that is closest to the sharpbill, contains the Royal Flycatcher(s), the Ruddy-tailed Flycatcher (Terenotriccus) and the yellow-rumped Myiobius flycatchers. These two families are likely more closely related to the tityra family than to anything else (with short internodes, it is hard to be sure). The other new families appear to be closer to the main group of Tyrannidae. The three Piprites, once considered manakins, form a new family (Pipritidae). So so the spadebills, together with the Neopipo and Kinglet Calyptura (Platyrinchidae). The Many-colored Rush Tyrant, with its coloration that is more like an Old World pitta than a New World tyrannid, has no close relatives at all (Tachurididae). Finally, we endorse the idea of Sibley and Ahlquist (1985c), of a group containing the Mionectine flycatchers, here called Rhynchocyclidae. I'm referring to the Rhynchocyclidae as Mionectine flycatchers because Sibley and Ahlquist initially tried to designate them as the family Mionectidae. It turned out that the group already had a name. At first it was believed that Pipromorphidae was the correct name, having been named by Bonaparte back in 1853 or 1854. However, a problem appeared. The genus Pipromorpha did not yet officially exist. It would not exist until Gray named it in 1855. If the term had been in common use, this wouldn't matter much, but it seems to have remained completely unused until revived by Wolters (1977). This unusual circumstance means that the first valid use of this old term was in 1977! Its priority dates to that and it is properly attributed to Wolters. But there are further complications. Other genera in the Mionectine group may also bear family names. A previous version of the TiF list treated the group as a subfamily together with Platyrinchinae and Tachurididae. Since Platyrinchidae dated to Cabanis (1847), it took priority. Now, Platyrinchidae has been separated, so Rhynchocyclidae (Berlepsch, 1907 (1854)) takes priority. It's priority dates to 1854 because Bonaparte had created the family Cyclorhynchinae based on Cyclorhynchus. Now Cyclorhynchus is a junior synonym of Rhynchocyclus. Berlepsch introduced the replacement name in 1907, and as a replacement name prior to 1961, it takes the original priority. Complicated, no? In the past, several would-be manakin species have turned out to be something else (e.g., Sapayoa). It now seems there is a core group of manakins, which consists of the species listed below except for a clade consisting of Neopelma and Tyranneutes, (see Rêgo et al., 2007). Although it has been suggested that the Neopelma/Tyranneutes clade belongs elsewhere, several independent genetic analyses (Barber and Rice, 2007; Rheindt et al., 2008a; Ohlson et al., 2008, 2013a; Tello et al., 2009) have concluded they are sister to the core manakins. The comprehensive studies of Ohlson et al. and Tello et al. give us confidence that all of the members of the Pipridae have now been correctly identified. I've put part of Neopelma in Tyranneutes based on the Hackett tree from Anciães and Peterson (2009) which would otherwise make Neopelma paraphyletic. Ohlson et al. (2013b) did not include the type species, and does not bear on this issue. The genus Antilophia has been merged into Chiroxiphia, as Chiroxiphia would otherwise be paraphyletic (Agne, 2012). Ohlson et al. (2013b) suggested placing the Green Manakin in a separate genus rather than folding it into Lepidothrix. Since no such genus was available, they created the monotypic genus Cryptopipo for it. The genus name of the White-crowned Manakin has been changed to Pseudopipra (Kirwan et al., 2014b) from Dixiphia. Kirwan et al. note that Dixiphia is a junior synonym of Arundinicola d'Orbigny, 1840. Ohlson et al. (2012) showed that the Kinglet Calyptura, traditionaly placed in the cotingas, is not a cotinga at all. Rather, it is a belongs with the spadebills (Platyrinchidae). Although sometimes made a separate family, the Phytotomidae (plantcutters) are also included in the Cotingidae. The overall structure of Cotingidae is now based on Berv and Prum (2014). Earlier relevant analyses included Ohlson et al. (2007) and Tello et al. (2009). I've distinguished several clades as subfamilies and tribes. Most of these are strongly supported in Berv and Prum. The most basal is the fruiteater clade (Pipreolinae). This is followed by the weakly supported red cotinga/berryeater clade (Rupicolinae). Tello et al. 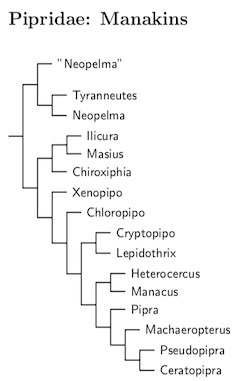 's (2009) analysis also grouped these species together, while Ohlson et al. (2007) placed Snowornis elsewhere. Snowornis has been a troublesome genus. It was once considered part of Lipaugus. The next branch is the plantcutter clade (Phytotominae). The Swallow-tailed Cotinga belongs in this clade, as do the Zaratornis, Ampelion and Doliornis cotingas. 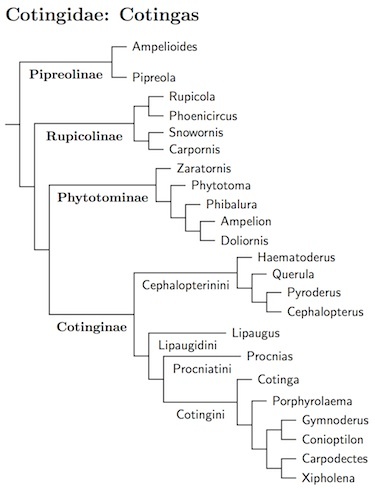 Everything else is in the Cotinginae subfamily. The basal branch (Cephalopterinini) includes most fruitcrows, the umbrellabirds, and capuchinbird. Berv and Prum found that the Capuchinbird is sister to the Amazonian Umbrellabird. I have moved it to Cephalopterus (Saint-Hilaire 1809) rather than leave in the monotypic genus Perissocephalus (Oberholser 1899). There is some question whether this is correct. Tello et al. (2009) placed the Capuchinbird in a different position, basal to Cephalopterus and Pyroderus. The next two branches are the pihas, except Snowornis (Lipaugidini) and bellbirds (Procniatini). The genus Tijuca has been merged into Lipaugus. Finally, we get to Cotingini, the blue and canopy cotingas. The support for this clade is weak. The blue cotingas form a strongly supported clade, as do Gymnoderus through Xipholena, but the position of Porphyrolaema has only weak support, and there's still a question about the whole Cotingini clade. However the bellbirds, blue cotingas, and canopy cotingas together are a fairly strongly supported clade, which limits the possiblities for alternative placements. The sharpbill has long been considered an enigmatic species, of highly uncertain affinities. It was easy enough to see that it belong somewhere in Tyrannida, but it has been impossible to pin down. As a result, it has often been put in its own family, Oxyruncidae. In fact, its family name traces back to 1831 (with a slight spelling change), making it an older name than Tityridae. Genetic evidence has suggested it is closer to the tityras than to the other major clades. However, it is not very close. Ohlson et al. (2013a) estimated its divergence time from the titryas at around 28 million years. It seems to be slightly closer to the Onychorhynchidae, but not by much. This distinctive bird with no close relatives is best put in its own family. Tello and Bates (2007) discovered a small clade, the “Myiobius assemblage”, hidden within the Tyrannidae. Both they and Rheindt et al. (2008a) found evidence that this clade was a early branch in the Tyrannida, but did not sample enough basal taxa to know where to put it. A paper by Ohlson et al. (2008) samples more of the relevant taxa. Their results suggest that the “Myiobius assemblage” is a basal clade in the Tityridae. However, the more recent paper by Ohlson et al. (2013a) was able to show it is deeply divided from the core Tityridae. They argued in favor of elevating the group to family status, as has been done here. I've followed AOU's NACC in treating Sulphur-rumped Flycatcher, Myiobius sulphureipygius, and Whiskered Myiobius, Myiobius barbatus as separate species. SACC lumps them into one. Both have recently decided based on the same evidence (or lack thereof). I don't know which is right. The race mastacalis may also deserve specific status, but again, the evidence is weak. The taxonomically troubling Schiffornis group has now grown into a family: the Tityridae. The original Schiffornis group, which includes the tityras and becards, forms the core of the Tityridae. This gathers together several genera previously classified as Tyrannidae, Cotingidae, and Pipridae (see Barber and Rice, 2007; Ohlson et al., 2008, 2013a; Tello et al., 2009). There is general consensus on how the core tityrids are organized. The main disagreement concerns whether Laniisoma and Laniocera are closest relatives, as in Ohlson et al., and Tello et al., or whether Laniocera is closer to Schiffornis, as found by Barber and Rice. Within the family, Schiffornis, Laniocera, and Laniisoma form one clade, which is sister to a clade consisting of the rest of the Tityridae, including becards (Pachyramphus) and tityras (Tityra). See Nyári (2007), Donegan et al. (2011), and SACC proposals #505, #543, and #543A. There might be more species here and it is possible that further adjustments will eventually be made. The White-tailed Tityra, Tityra leucura, was long known only from a single specimen collected in 1829 and was thought to be a form of Black-crowned Tityra, until its rediscovery by Whittaker in 2006. Whittaker (2008) makes the case that it is a separate species. Ohlson et al. (2013a) suggest recognizing this as the subfamily Schiffornithinae (Sibley and Ahlquist, 1985). However, Ptilochlorinae has priority. The subfamily name Ptilochlorinae is based on Ptilochloris (Swainson, 1837) which is a junior synonym of Laniisoma (Swainson 1831, type elegans). However, as the subfamily name was never updated to use Laniisoma before 1961, it remains Ptilochlorinae. What the piprites are related to has long been a puzzle. They've variously been placed anywhere from the manakins to the tyrants. We now have a pretty good idea what the piprites are related to. They aren't, or at least not closely. That's why they get their own genus. They're roughly equally related to the next four families: Platyrinchidae, Tachurididae, Rhynchocyclidae, and Tyrannidae. I've put them first because the DNA suggests they may be a slightly older lineage than Platyrinchidae, Tachurididae, and Rhynchocyclidae. A Calyptura/Platyrinchus/Neopipo clade is basal within the Platyrinchinae. The Kinglet Calyptura has traditionally been included with the cotingas, but Ohlson et al. (2012) show that it belongs here. The Kinglet Calyptura was long believed extinct when rediscovered in the mid-1990's. Its future remains doubtful. Although Tello et al. (2009) consider Neopipo unrelated to Platyrinchus, Rheindt et al. (2008a) and Ohlson et al. (2008) found evidence they are sister taxa. All three analyses used different genes, so I'm going with the majority here. There is also a question about whether this group is closer to the other Platyrinchinae or not as one of the genes analyzed by Rheindt et al. (2008a) placed it outside this clade and closer to the remaining Tyrannidae. The other genes analyzed by Rheindt et al. agrees with the placement I use, as do Ericson et al. (2006b), Ohlson et al. (2008) and Tello et. al. (2009), so I have pretty high confidence that it belongs there. The striking Many-colored Rush Tyrant, Tachuris rubrigastra, is sometimes errorneously considered an Elaeniid. It has no close relatives, forming a deep branch near Tyrannidae. Sibley and Ahlquist's (1985c) Mionectine group has grown. The genera Pogonotriccus, Phylloscartes, Rhynchocyclus, Tolmomyias, Cnipodectes, Oncostoma (in part), and Myiornis have been added to the original group. Sibley and Ahlquist were correct that these flycatchers are relatively distantly related to the main body of Tyrannidae. In fact, Ohlsen et al. (2013) estimate that the most recent common ancestor was in the Oligocene about 28 million years ago, in about the same time frame as the common ancestor of Piprites, Platyrinchidae, Tachurididae, and Tyrannidae. The diversification of the remaining Rhynchocyclidae occured somewhat later, beginning with a three or four way split a bit over 20 million years ago. We treat the pieces of the split as four subfamilies: Pipromorphinae (core Mionectines), Rhynchocyclinae (Flatbills), Cnipodectinae (Twistwings), and Triccinae (Tody-Flycatchers). Three sets of genes have been used to investigate these relationships, by Ohlson et al. (2008), Rheindt et al. (2008a), and Tello et al. (2009). Further, Ohlsen (2013a) combines the genes used by Ohlsen et al. (2008) and Tello (2009). Unfortunately, they give different results for which group is basal! Ohlsen et al. (2013) does a time-calibration that rates it a tie, but the rest of their analysis provides a slight bias toward branching in the order shown. I follow Miller et al. (2008) and re-split Mionectes into Pipromorpha and Mionectes. Moreover, Tepui Flycatcher, Pipromorpha roraimae (including mercedesfosterae), has been split from McConnell's Flycatcher, Pipromorpha macconnelli (Hilty and Ascanio, 2014). The sequence is based on Miller et al. (2008). I also divide Pogonotriccus Bristle-Tyrants from Phylloscartes, as is commonly done (but not by SACC, yet). 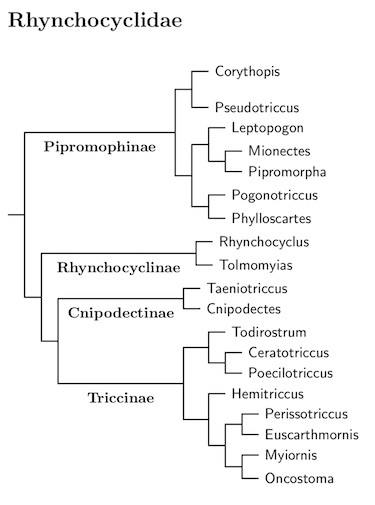 The tody-tyrant/flatbill/twistwing clade has two main pieces, Triccinae and Rhynchocyclinae, and the twistwing group (Cnipodectes and Taeniotriccus), provisionally called Cnipodectinae. Rheindt et al. (2008a), Ohlson et al. (2008), Tello and Bates (2007), and Tello et al. (2009) again give different arrangements of the three clades. Tello et al. (2009) is alone in placing Cnipodectinae away from the Triccinae and Rhynchocyclinae. There are indications in Ohlson et al. (2013a) that Cnipodectes and Taeniotriccus may not really be a separate group. It seems best to put them in a trichotomy for now. Tello et al. 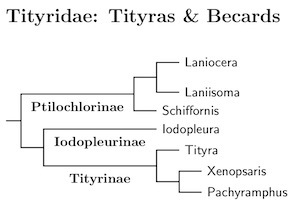 (2009) proposed the name Todirostrinae for the Triccinae, apparently not realizing that the group already had a name. Triccinae is based on Triccus (Cabanis 1845-46, type T. cinereum), which is an objective junior synonym of Todirostris (Lesson 1831, also type T. cinereum). The name Triccinae was not updated prior to 1961, and so remains the correct subfamily name. It has plenty of priority over Todirostrinae (Tello et al., 2009). There are some changes within the tody-tyrants (Triccinae). The whole Hemitriccus group (including Lophotriccus, Myiornis, and Oncostoma) is rearranged based on Tello and Bates (2007), Rheindt et al. (2008a), and Tello et al. (2009). As recommended by Tello and Bates, Lophotriccus (including the former Atalotriccus) has been merged into Oncostoma, as are Hemitriccus minor and spodiops. Note that Oncostoma (Sclater 1862) has priority over Lophotriccus (Berlepsch 1883) and Atalotriccus (Ridgway 1905). Five species are probably sister to Oncostoma, however, it's not clear how they relate. According, the three bamboo-tyrants are retained in Hemitriccus (Cabanis and Heine 1859, type diops), while the other two are moved to Idioptilon (Berlepsch 1907, type zosterops) with the three genera treated as a trichotomy. The Boat-billed Tody-Tyrant moves to the genus Microcochlearius (Chubb 1919), which is sister to Myiornis. The appropriate name for the remainder of Hemitriccus, which may form a clade, is Ceratotriccus (Cabanis 1874, type furcatus). This group is sister to the Microcochlearius/Myiornis clade. The changes in species names are due to the fact that Oncostoma and Idioptilon are due to the fact that both are neuter in gender, while Ceratotriccus, Hemitriccus, and Lophotriccus are masculine. There's some guesswork here as to which species go where and there may be further changes once more study is done of these species. The Acre Tody-Tyrant, Oncostoma cohnhafti, was described by Zimmer et al., (2013), although they use an older taxonomy and place it in Hemitriccus. Although they don't discuss it, their genetic results support separating Oncostoma pallens from Snethlage's Tody-Tyrant, Oncostoma minor, as a distinct species. Since pallens refers to the pale-green color, we can call it Pale-green Tody-Tyrant (Todd's Tody-Tyrant is an alternative). There remains some uncertainty about whether these species belong in Triccinae, so I retain them as a separate group.